Yes yes, the international break is over and some of those big names have returned back to their respective domestic clubs, hoping their ever so faithful fantasy followers would be able to share in their glory and form. But more importantly is the fact that the damn transfer window has now been slammed shut. Not much went down this year, but atleast the heavy hitters will now have their heads in the right place. So lets get to it. David De Gea (5.3m) is back. Arguably the best transfer to not happen which keeps him in the English Premier League. This outstanding and talented lad is there for the long run and no matter what history he has with Van Gaal, he will definitely be the main keeper for Manchester United now after signing a 4 year contract with the Red Devils. A home game against bitter rivals Liverpool couldn’t paint a better homecoming picture for the prodigal son. 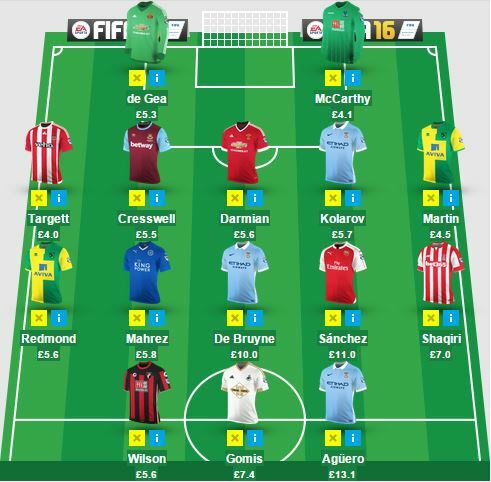 Alternatives: Alex McCarthy (4.1m) is our budget keeper for this week. The Crystal Palace stopper has been surprisingly good between the sticks, with back to back victories in his name. Aleksandar Kolarov (5.8m) and Matteo Darmian (5.7m) retain their spots in our squad purely due to their eye for those bomber man runs down the flank. 7 Clean sheets between the two of them makes it a no brainer. West Ham’s Aaron Cresswell (5.5m) and Norwich’ Russel Martin (4.5m) are new additions. 2 assists and 3 bonus points for the West Ham man in the last 2 games and Newcastle at home, should spell good news for the Hammers. Russel has 2 goals already in his name, with his aerial threat being his most deadly asset. Targett (4.1m) has been retained for now mostly because of his budget friendly as well as rising price. 0.1 more and he’s money in the bank. Alternatives: Luke Shaw (5.6m) is constantly churning out those bonus points and assists, and seems to be getting more consistent, but his injury history is the only reason why we’re on the backfoot with him. One major signing for Manchester City last week was Kevin DeBruyne (10.0m). He played in the hole position for Wolfsburg last season and has now returned back to the Premier League with 10 goals and 20 assists in his name from the Bundesliga. Manuel Pellegrini has confirmed that David Silva is still carrying an ankle knock, so will be rested this week, spelling a sure shot start for our record breaking Man City signing. He’s a player who’s always looking to score and we’re certain he’s going to get all the support he needs from his new teammates. Riyad Mahrez (6.1m), Sanchez (11.0m) and Redmond (5.6m) have been retained in our squad this week, after returning from the international break without any injury. All still heavy hitters from the fantasy perspective. Stoke City’s Xherdan Shaqiri (7.0m) was unlucky last gameweek due to Stoke picking up 2 red cards in the same game. However with a big game against Arsenal this week, we’re sure Shaquiri will rise to the occasion to showcase what just the ex-Bayern Munich player is made up of. He’s already picked up an assist in the Premier League, so its not like he’s still finding his feet. Alternatives: Dimitri Payet (7.6m) has a home encounter against the weak defense of Newcastle and also has spotkick duties in his kitty. Another upcoming midfielder is Andre Ayew (7.2m) with 3 goals, 1 assist and 6 bonus points in 4 games and newly promoted Watford as the opposition this week. Talk about consistency and Bafetimbi Gomis (7.4m) is the first name that pops up, with 4 goals in 4 games. His form , even against the toughest of oppositions is highly commendable, and since he’s the lone striker in the team, the opportunities he has is now completely his for the taking. Aguero (13.2m) and Wilson (5.8m) have retained their spot as well as they face fairly easy opponents namely Crystal Palace and Norwich respectively. Alternatives: Diafra Sakho (6.5m) looks to be finding his form with a goal and an assist in the last two games and his a good budget priced forward for the trip to Newcastle. This entry was posted in General, Squad and tagged english premier league, EPL, Fantasy Football, fantasy football squad, fantasy football tips, fantasy football transfers, fantasy premier league, football transfers, FPL, Gameweek 5, GW5, Transfer Tips. Bookmark the permalink.